The Neal Kocurek Memorial Austin Convention Center is a multi-purpose convention center located in Austin, Texas. The building is the home of the Texas Rollergirls, and was also home to the Austin Toros basketball team, until their move to the Cedar Park Center in nearby Cedar Park in 2010. The facility is also the primary "home base" for the internationally renowned South by Southwest technology, music and film conference/festival, held annually in March. In the early 1980s civic leaders became concerned that Austin was being passed over as a site for major conventions because the city's main event facility, Palmer Auditorium, was too small. In 1983 the city council unveiled a concept for a $35 million convention center as part of a $350 million complex of hotels and parkland on the south shore of Town Lake (now Lady Bird Lake). Resistance to this plan by neighborhood groups near the proposed site and downtown business leaders caused the city to consider several other sites, finally choosing a downtown site near Waller Creek for construction. Financing was provided for by a US$69 million bond sale, approved by referendum on July 29, 1989. The grand opening ceremony took place on July 4, 1992. On September 1, 1999, construction began on an expansion aimed at nearly doubling the size of the facility from 441,000 square feet (41,000 m2) to 881,400 square feet (81,880 m2). The grand reopening took place on May 18, 2002. The enlarged Convention Center's five exhibit halls have a combined 247,052 square feet (22,951.9 m2) of column-free space. There are 54 meeting rooms and two ballrooms, including one of the largest ballrooms in Texas with 40,510 square feet (3,764 m2). The Austin City Council changed the name of the Austin Convention Center on July 29, 2004 to honor civic leader Dr. W. Neal Kocurek (1936–2004), who helped rally community support for construction of a convention center for Austin. Kocurek died after suffering a stroke on March 29, 2004. The formal dedication took place on December 2, 2004. ^ "Inside the Austin Convention Center". Austin American-Statesman. Austin, Texas: Cox Enterprises. June 28, 1992. p. C1. 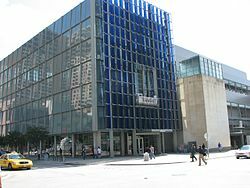 ^ "Austin Convention Center renamed for civic leader". Austin Business Journal. American City Business Journals. December 4, 2004. Retrieved October 29, 2013. ^ "Directions, Maps, and Parking". Austin Convention Center. Retrieved May 6, 2014. ^ "Convention center bond sale passes". The Daily Texan. July 31, 1989. ^ "City Convention Center opens on time, with style". The Daily Texan. July 6, 1992. ^ "Convention Center expansion could boost economic impact". The Daily Texan. September 2, 1999. ^ "Community Open House to unveil Convention Center expansion with Austin flair". Archived from the original on 2002-06-18. ^ a b "City to unveil plaque honoring civic leader Neal Kocurek". Archived from the original on 2004-12-17. Wikimedia Commons has media related to Austin Convention Center.